A hundred years or so ago, a brewery on every street corner wasn’t an indicator of a wildly growing industry. Prior to prohibition, there was no such thing as a “craft beer bubble,” and certainly no one to debate its existence. The lack of refrigerated trucks necessitated the abundance of breweries around the country. That wasn’t a sign of impending market saturation, but rather a sign of a community focused on providing the neighborhood with beer. Times have changed, of course. No longer is beer a quaint little industry that flies under the radar. Today, there are more breweries in the country than ever—more than 6,000. The corner brewery is becoming a thing again. In fact, more than three quarters of drinking-age Americans live within 10 miles of a brewery. Craft beer is in the spotlight, and that light is shining brighter in Denver, Colorado than most places. It’s a city with a booming beer scene that is experiencing a crowded market and learning how to adapt accordingly. Cerebral Brewing has grown faster than other local Denver breweries in the two years they’ve been open by returning to a focus on the neighborhood and brewing a diverse range of beers with an ahead-of-the-curve approach to styles. The 650 barrels the brewery produced in its first full year of production (2016) was above average (400-500 BBLs) for its brewhouse size. And Cerebral’s early success was recognized by RateBeer when they received best new brewery in Colorado honors in 2017. They’ve also won a handful of medals (including one from the Great American Beer Festival) in their short existence. But their quick start out of the gate wasn’t without growing pains of its own. Sean Buchan was a physical therapist with a homebrewing hobby and an affinity for IPAs when he co-founded Cerebral. But as head brewer, he didn’t want his professional career to be based on the style. Instead, he opted to built out a portfolio based on an obligation to his own abilities as a brewer. But Buchan found himself reaching for other options while drinking in his own taproom. The older-school brewpub model is something many beer drinkers have become familiar with: a Brown Ale, an ESB, a Blonde Ale, a Lager. It’s a lineup of usual suspects that don’t take many risks and certainly don’t cater to the ever-growing, try-the-new-stuff savviness of the modern day craft fanatic. For Buchan, killing those beers was necessary to grow as a brewer—and to grow his business. Offering a variety of styles was becoming the new mode to survival in Denver, especially with other local breweries beginning to pull out all the stops. Beer makers like Black Project Spontaneous & Wild Ales and TRVE Brewing Company were beginning to build impressive blending and barrel programs with both wild and bourbon-aged brews which upped the ante for everyone. But Buchan also had to pay mind to the folks that were sitting on the barstools in the taproom that initially skewed a bit older in demographic due to the styles on tap. Slowly but surely in early 2016, Cerebral made a shift from those duty-bound beers of yesterdecade and moved toward a more diverse and up-to-date lineup of beers all while being careful to not alienate its clientele. Throughout the process, Buchan found that the older audience shifted along with the portfolio allaying any fear about early patrons being turned off by the shift in direction. Other folks are taking notice as well. Buchan put as much thought into his location as he does into his beers. The highest concentration of breweries in The Mile High City can be found in the River North Art District (RiNo), which houses most of the city’s restaurants, beer makers, and nightlife. Cerebral’s brewhouse and taproom lives a few miles Southeast of downtown in Denver’s Bluebird District, just off of Colfax Street on Monroe. It’s an area with a rough, gritty history of crime, drug use, and homelessness that has mostly rehabilitated as the area has become more populated. For an entrepreneur, moving away from the density and foot traffic of a popular area like RiNo might not seem like a wise business move, but it provided a buffer that’s allowed Cerebral to develop an identity. For a market like Denver, that cushion means everything. There’s a grim reality to setting up shop in the popular neighborhood as a handful of breweries have either had to relocate, reconcept, or close altogether. River North acts as a litmus test for how the rest of the city is going to react. Big name breweries such as Odell, New Belgium, Ten Barrel, and Blue Moon are all set to open—or have already opened—brewhouses and taprooms in RiNo’s crowded space in an effort to benefit from the popularity of the neighborhood. As those bigger businesses have moved in, Buchan says, it’s put a squeeze on the smaller breweries. It seems that thought isn’t lost on others hoping to start their own brewery in Denver, despite evidence to the contrary. During the nearly year-long negotiations to lease the building that would become home to Cerebral, Buchan learned that he and his business partners were in the running against 35 other breweries for the spot. Thirty. Five. “I can’t help but think most of those places didn’t pan out because there aren’t 35 breweries opening in Denver right now,” Buchan says. It’s a staggering number to comprehend, but proves just how crowded beer has become. And it paints an interesting picture of what might be to come as the rest of the country catches up. Cerebral’s location put them in the middle of a handful of affluent communities that have allowed them to create strong ties with the denizens of Bluebird District. One way they’ve done this is by prioritizing an own-premise model that gives them better control over their sales (and the profits from those sales). They’ve experienced 25-30% growth from year one to year two despite concerns that a shift in brewing philosophy might alienate patrons. And one way they’ve done that is by offering some trendy styles, especially IPAs. Beyond IPAs, Buchan’s excited about a barrel program that’s starting to mature and produce a consumable product. It’s the side of the brewery he’s most looking forward to growing, and it features several Brett-laced Saisons, as well as Stouts and Porters sitting in a variety of bourbon and rum barrels from distilleries such as Laws Whiskey, Heaven Hill, and Whistle Pig. While the time investment in these beers is kind of intense (they can take anywhere from four to 12 months to find the sweet spot), they’re a hit—Buchan says he’s having trouble keeping them on tap. 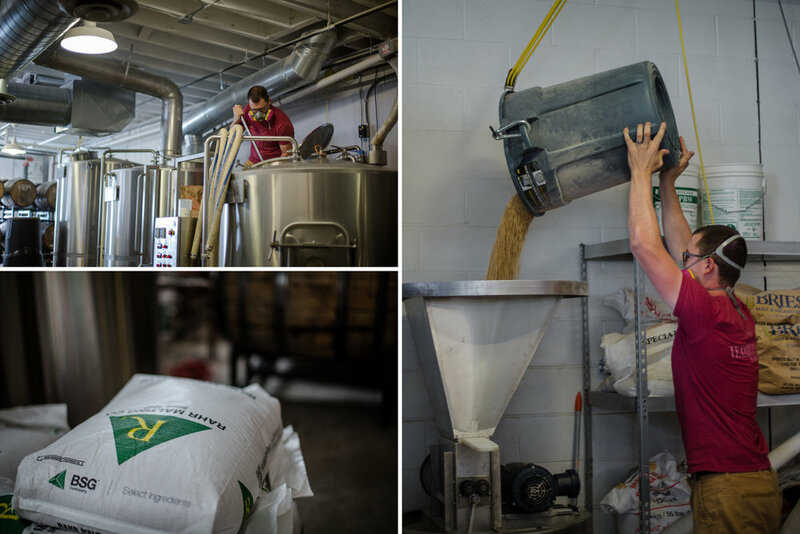 Growth is hard for any brewery, let alone the ones in a packed beer city like Denver. Even own-premise can only be pushed so far due to a lack of physical space. Cerebral sells about 75% of their beer via retail, with 25% going to festivals and a few outside accounts. Buchan reported finishing 2017 at just more than 1,000 BBLs, and anticipates reaching 1,500-1,800 for 2018. He believes that’s about half of his brewery’s total capacity. The way Buchan sees it, there aren’t many viable options for growth outside of Cerebral’s current residence. The idea of another space is unappealing because that would require another loan and another build-out, but it’s something they’ve considered. The other route would include renting a warehouse on the cheap for barrel storage while they continue to grow stainless back home, but that would be as big as they’d get. A third option, which seems to be the least appealing of all to Buchan, would be to open a second taproom. And that taproom would have to include another production facility. With so much competition across all sales channels, it’s no surprise there are Denver breweries that have grown beyond their means. It’s something Buchan is wary of when there’s so little space in both the market and available real estate. Some have begun contracting their beer without a physical location in Denver proper only to open a taproom a year or two later without, as Buchan sees it, having invested in the community. Cerebral has strong ties to the neighborhood in its short existence in the Bluebird District, and Buchan continues to build upon early momentum on that front. He hired Sami Hartman as a full-time sales representative, and they’ve been able to push outside sales while keeping up with taproom traffic. Off-premise sales make up a small portion of Cerebral’s overall sales, but a need to be present in the market making relationships and getting visibility on shelves is critical to bringing more people into any modern brewery’s taproom. While it’s not in Buchan’s plan to ever run a 50-BBL-brewhouse production facility, he’d like to focus extra effort on diversifying Cerebral’s beer by continuing to push stainless production while slowly growing Brett-based and barrel-aged beers alongside some wild ales. But the whole thing is an unpredictable balancing act. Nevertheless, Buchan is looking forward to 2018, as Cerebral recently rented about 500-square-feet of warm storage space at Laws Whiskey House for bottle conditioning, with hopes to double that footprint in March. With relief in physical space and time spent in barrels, Buchan’s hoping to find a more stable schedule of beer releases in the coming year as well as hiring a third brewer full-time to help with production. It’s been a long road for Buchan, who went from being a physical therapist to an award-winning brewer in one of the country’s top beer markets in a little more than two years’ time. And his efforts are beginning to pay off. Releases often sell out quickly at the taproom, and the continuing development of the Bluebird District surrounding the taproom has an even more encouraging outlook. In fact, there’s another large development going up nearby with ties to his former career. He attended physical therapy school just around the corner, which is how he became familiar with the neighborhood. While the campus no longer exists, Buchan isn’t feeling any nostalgia. After all, he’s got a new business to run. “They blew it up,” he says. “But that’s OK. They turned it into condos and that’s definitely going to help us out."